Meet Sara and Kate, two Mormon girls who love to cook. They're also wives and mothers balancing home management, part-time work, church and community involvement, and countless other things — just like you! As busy moms, their philosophy is that cooking really good food for your family doesn't have to be complicated. In fact, cooking at home can be a delicious, fun, and easy way to care for your family and friends. 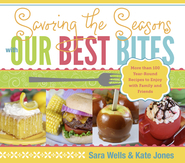 Our Best Bites bring together more than 150 recipes for delicious, easy meals and snacks that are fun to make, include healthy, fresh ingredients, and are more popular with families. The authors share their tips and tricks (mixed with an abundant sense of humor), and step-by-step, full-color photographs for each recipe. This indulgent twist on an old family recipe is great for boxing up for friends and neighbors during the holidays. It is equally delicious with toasted pecans or walnuts in place of the cashews, or a mix of all three. Cook sugar, sour cream, and 1/8 teaspoon table salt in a heavy saucepan on medium high heat. Bring to a simmer and cook until temperature reaches about 245-248°. If you don't have a candy thermometer, you can test your caramel mixture by dropping a small amount into a glass of ice water. You should be able to make a little ball that is soft and pliable, but firm enough to hold shape. Remove candy mixture from heat and stir in vanilla. Add nuts and stir to coat. Caramel will be very soft and somewhat liquid. Stir to coat and then spread out onto parchment paper. Using a rubber spatula, stir nuts as mixture cools, scraping caramel mixture from parchment. Caramel will solidify and after several hours will be dry to the touch with a sugary texture. Place chocolate in a heavy duty zip top bag and microwave for 30 seconds or until melted. 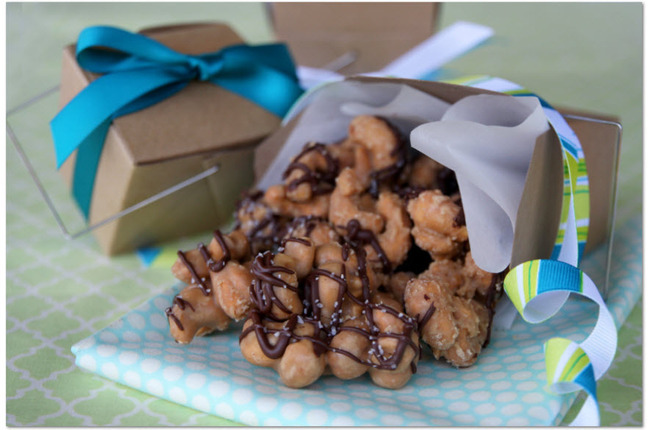 Cut a small opening in the corner of the bag and drizzle chocolate over nuts. Sprinkle with desired amount of sea salt. Let chocolate dry (you can place nuts in the fridge to speed up the process) and then break into pieces. Kate Randle Jones was born and raised in Logan, Utah, where she dabbled in cooking, but never seriously. After her sophmore year at Brigham Young University, she married Sam Jones, and they suddenly found themselves to the the stereotypical broke college student couple. Due to the fact that they needed to eat and she needed a hobby, Kate began cooking and baking nearly everything from scratch. Once she got comfortable in the kitchen, she started experimenting with different tastes, recipes, and methods. She graduated from BYU in 2004 with a degree in English and considers herself beyond lucky that she gets to do her two favorite things: write and cook. In her spare time, she loves to read, entertain, and travel (or, at the very least, think about traveling!). She currently lives in an old house with a big yard in Louisiana with her husband, Sam, and her three children. Sara Wells was born and raised in the Seattle area. Inspired by the lush green surroundings of the Pacific Northwest, she earned a degree in horticulture from Brigham Young University and put her talents to work as a landscape designer. Her knack for design, as well as a lifetime passion for culinary exploration and entertaining on the spur-of-the-moment, resulted in catering opportunities, which allowed Sara to showcase her belief that food can taste great and be beautiful as well. Sara served an LDS mission in Curitiba, Brazil, where she picked up a love of fresh ingredients and a taste for Latin flavor that influences much of her cooking today. She and her husband, Eric, currently reside in Boise, Idaho, where they cook, eat, laugh, and play with their three young sons, Tyler, Owen, and Jack. The Mint Brownies are addictive! My daughters friends at school were asking for the recipe. We, West Australians love it! Can't wait to try every recipe. This weekend we are trying the Black Bean and Mango Salsa. Looks yum! I have made about one third of the recipes and everything is so delicious. My plan is to make all the recipes in the book. I love all the tips and menu suggestions. I highly suggest buying it. You have found the best cookbook. I am dietitian and a cookbook junkie. My husband is always telling me I have enough cookbooks. However, he was very pleased with this one. Every time I make something from this cookbook, he says, "Add that to the rotation". I like the balance of nutrition with taste. If I ever write a cookbook, I will pattern it like this one, with the beautiful pictures on each page and the additional tips. You can't go wrong with this one! This is the absolute best cookbook I have. I have tried many recipes and they are all delicious. You will not regret this purchase! I love this cookbook! I'm new to cooking and I would call this cookbook Easy Gourmet! Every single recipe I've made from this cookbook or the website I have loved! If I bring a recipe to a relief society event or a baby shower..everyone LOVES it! Buy it! Buy it for your girlfriend...your mom...your sisters! Your VT companion....your Home teaching families! haha...you'll love it! I can't count how many cookbooks I've purchased and then only find a handful of recipes that my family and I actually like. This one is a huge exception. We have tried about 10 of the recipes so far, and each one has been given a gigantic "KEEP" by my family, and that's really saying something! I never thought I liked to cook...now, I do! I just ordered the cookbook because I print almost every one of your recipes. I love your great photographs and recipes. Best wishes! I can't wait to receive mine in the mail! Five stars just aren't enough!!! This is the BEST cookbook EVER!!!! I was given it as a gift and I've never made so many recipes out of a cookbook before. I've LOVED EVERYTHING I've made and so has my family. My husband says I'm now only aloud to make things out of that cookbook. I've given it as gifts to family and friends since and I really can't say enough about it. I look forward to seeing what's on my menu every night. I love how easy the directions are and love the tutorials. Five stars just aren't enough for this delicious cookbook. I've tried a number of the recipes in this book and have loved every one of them! They are easy to follow, shop for, and if the recipe says "quick and easy" it really is. I have made a goal to try everything by the end of the year. I hope there will be another book because I'm not much of a blog follower. This is a one-of-a-kind cookbook filled with recipes that sound and look excellent! I have now tried the White Bean Chili - Wow! My whole family loved it! Thanks for this great new cookbook. This cookbook is one-of-a-kind! I bought six, one for myself and the rest to give as gifts. The recipes are easy and yummy. The photos are beautiful! Don't miss out on getting one. I needed new ideas for dinners and found theses recipes are delicious and instructions are fairly easy to use. I would recommend to anyone who enjoys baking from scratch, and enjoys food which is not too difficult to prepare. I just got this book for my birthday and couldn't put it down. I am NOT a cook at all. But this book inspires me to make mealtime a priority for my family. The recipes are full of beautiful photos, recognizable ingredients and fantastic alternatives. I LOVE LOVE LOVE this and am so glad Sara and Kate took the time to share their talents with us! Buy one for you and one for each of your friends! These ladies know their stuff! I ordered a bunch of these as gifts for friends and family. 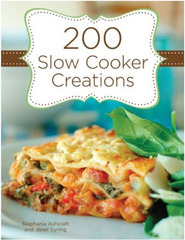 Great recipes, fun ideas, and step by step instructions with photos. Can't wait to get mine!